Born into a hard-working cattle ranch family in Brazil, Eduardo began his life around horses and started riding at age 5. 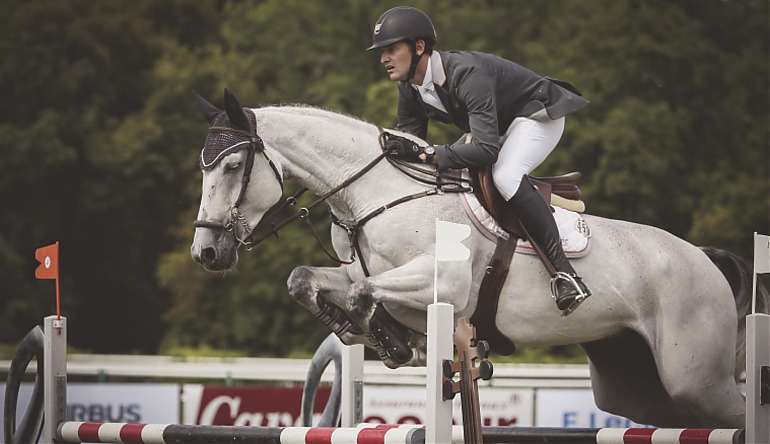 At 19 years old, Eduardo’s commitment to a professional career in show jumping led him to Europe where he remained for four years before moving to Monterrey, Mexico. After building his own successful sale and show jumping training business in Mexico and meeting now business partner Enrique Gonzalez, Eduardo made the move to California in 2010. Eduardo has grown into a world-class rider regularly competing and placing in grand prix events around the world. In 2015, competing for his native country Brazil, he helped his team secure a big win in the $300,000 BMO Nation’s Cup at the Spruce Meadows Masters Tournament. Throughout 2014 and 2015, he has shown remarkable consistency with top placings at events around the world. Other highlights include member of the gold medal winning (BRA) team at the 2013 Nation’s Cup in Arezzo, Italy, and in competing in the HITS $1 Million Grand Prix in Thermal, California, in 2014 ad 2015. In addition to maintaining his own demanding competition schedule, Eduardo co-manages E2 Stables where he is able to focus on sales and the development of talented show jumping prospects. Eduardo continues to hone his skills as a rider and trainer by regularly working with Norbert Nuxoll in Germany. His current ambitions include competing at the 2016 Rio de Janeiro Olympics and winning the gold medal in his home country.